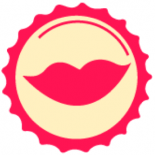 Beer maven Christine Celis, daughter of legendary Brewmaster Pierre Celis, and herself former President of Austin’s Celis Brewing, is teaming up with Uncle Billy’s Brew & Que and Austin Java for the latest release in her Gypsy Collaborations series. 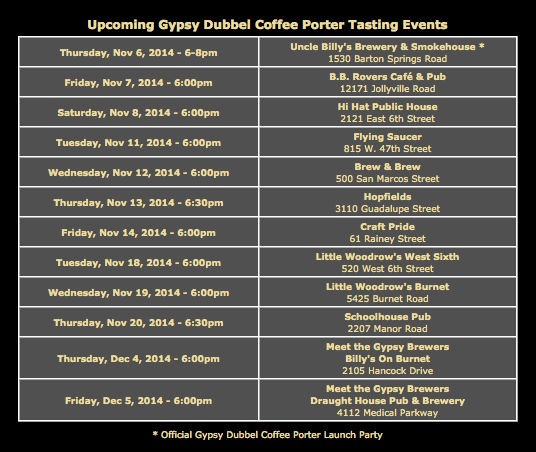 The innovative new brew, a Dubbel Coffee Porter, is being released tonight (Thursday, November 6) at Uncle Billy’s with launch events to follow at bars around Austin throughout November and December. Christine and former Celis Brewer Kim Clarke released their first Gypsy series collaboration, a Belgian IPA, with Austin’s Adelbert’s Brewery last fall, and chose Uncle Billy’s as the next collaborator for their series. In addition to Uncle Billy’s, Engel is also part-owner of Austin Java. The local chain’s Barton Springs location is just a stone’s throw away from the brewpub, making it a match made in coffee + beer heaven. To help shed some light, Patrick Palmer, Master Coffee Roaster for Austin Java, was brought on board. After some taste tests, Palmer eventually landed on a blend of Guatemalan and Peruvian coffees to be cold pressed and incorporated into the beer before kegging. Palmer has collaborated with Uncle Billy’s before, lending his coffee expertise to the brewpub’s Insomnia Stout, but really enjoyed the process of working with Uncle Billy’s Brewer Brad Mortensen and the team from Celis on this beer. Mortensen elaborated on just how everyone’s efforts contributed to the final product. 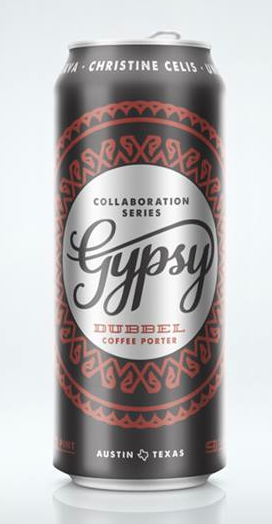 After Gypsy’s initial draft release, it will also be released in cans (four packs of 16oz pounders) and distributed to retailers around Austin. Tonight’s Gypsy release at Uncle Billy’s will run from 6 to 8pm. Click on the table above or visit the Gypsy Collaborations Website for information on Gypsy’s other launch events.